Fort Worth Star Telegram. Saturday, September 4, 1993. FORT WORTH- In the market for some prerevolution rubles from jolly old, uh, Russia? Or a genuine KGB watch crafted by hand for members of the famous secret police? Or a full-length, wool lined "summer coat" once worn by a three-star admiral in the Soviet Navy? Where to go? Pier 1? Nyet. Not a chance. To the tiny Russian Island Boutique in Hulen Mall? Da. Er, yes. A made-in-Russia museum-store In an Airy storefront in the upper centrum of the mall, Russian Island - RI for short - opened Aug. 1 last year, about the same time as its sister emporium in Dallas' Galleria. What gives RI its museum quality is that much of what's for sale is either art or bona fide artifact from what until two years ago was the USSR What gives it its almost experimental, cutting-edge feel is its colorful entrepreneur/founder, Mikhail Frumkin. 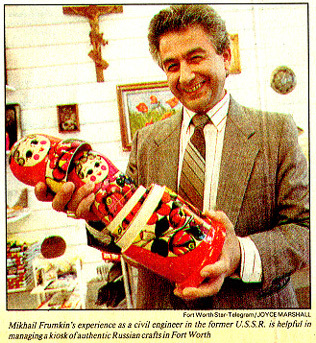 "Everything you can buy here is from Russia; if you find anything in my store that says 'Made anywhere else,' it is your's free of charge," said Frumkin, whose other holdings include a consulting service that provides "Russian language classes taught not just by Russians, but by teachers who are Russians" and who can assist you in negotiations for "made in Russia" goods. A short, impeccably groomed man with deep brown eyes and swept-back salt-and-pepper hair, Frumkin, a former civil engineer who at one time was boss to 50 engineers and architects in his homeland, emigrated from the then USSR in 1979. "When Mr. Carter and Mr. Brezhnev made a deal," he explained, "Brezhnev wanted American wheat. To get it, he let 50,000 people leave, including me." Merchandise in RI ranges in price from $1 to $1,500, he said. "Approximately 80 percent of what we sell is handmade." Yet if the impression is that this store is pricey, nyet again. On the other hand, much of the merchandise seems even underpriced. The store's inexpensive gift items include hand-painted metal thimbles ($3.95); feather and leather necklaces ($1.95); quality cotton ($2) and wool ($1.50) socks; and framed original paintings, tiny but with considerable detail, for under $10. Lapel and brooch-type pins, including those sold during last year's Catherine the Great exhibition in Dallas, go for under $5, as do color full hand-painted banners. RI offers more than 100 kinds of matrioshkas, or matryoshkas, the popular doll within a doll within a doll that symbolizes, Frumkin said, "the unity of all our generations and all our large families." The matrioshkas, which come primarily from a region north of Moscow, range in price from $11 to $1,300 - the tiniest hand-painted doll within a doll being a minuscule 1/32 of an inch tall. "But you get a magnifying glass and you can see all the detail on the face, the eyes, the body," Frumkin said. "Very, very tiny details." There are elegant, hand-painted and hand-inlaid lacquer boxes that begin at $120. Hand-painted wooden eggs ($6 to $300) from Belarus. Flax dolls ($9.95-$26.95) from the same region. Hand-cast iron sculptures and containers from the Ural Mountains that begin at $14.95. As with any other store that sells true art, however, the best stuff can cost more. Personal favorites include original canvases by noted Belarus artist Vladimir Chernyshov ($400-$600); hand-painted metal and ceramic pocket watches that sell for $129 or "if you want your husband's or wife's picture painted on it and can wait for us to order it from Russia,"$800. As for other unique artifacts, clocks made for nuclear-powered Soviet submarines - but which are home- or boat-adaptable and waterproof for up to five atmospheres of pressure - go for $249 apiece. Frumkin said the two RI stores actually were an experiment, started during last year's Catherine the Great exhibition in Dallas. "We were encouraged that people bought what we had," he said. "We also learned that not many people in the U.S. know about Russian culture. "We knew at that point that to be successful, we would have to have merchandise from all of Russia, every region," Frumkin said. "You can't just sell merchandise from Moscow, you must have items from the Far East of Russia, from the Ural Mountains, from Siberia, from all parts. "My officials," Frumkin added sounding very much like a life-long capitalist, "have contact with all regions of Russia." And though Frumkins primary customers have been "people from Russia, people interested in Russian culture or people going to Russia," that is changing. Trade secrets, a column about stores and shopping, appear Saturday. Send ideas about stores and retailers to Trade Secrets Box 1870, Fort Worth, Texas 76101.